SONOMA, Calif. – (DECEMBER 12, 2017) – Today, Jonny Westom, executive director of the Sonoma Valley Visitors’ Bureau (SVVB), announces plans to depart the SVVB, as well as resign his board positions with Sonoma County Tourism and the Sonoma Valley Vintners & Growers Alliance. Westom has accepted a new position as executive director of Visit Dana Point, California. Westom, his wife and young son are relocating in order to be closer their families, both of whom live in Southern California. Gary Saperstein will serve as interim executive director, while he, Westom and the SVVB Board of Directors search for a replacement. Westom will continue with the SVVB in an advisory role, working directly with the board of directors and the new executive director to assist with making the integrated marketing strategy transition seamless. Westom, who has held the title of executive director for almost three years, led efforts to reorganize the Sonoma Valley Visitors’ Bureau, furthered the destinations brand message and promotion, and led the tourism recovery efforts for the destination following the recent wildfires. During his tenure, Westom was selected as one of the North Bay Business Journal’s “Forty Under 40” most impressive young professionals in 2017. Prior to working with the SVVB, Westom worked with the Greater Palm Springs Convention & Visitors Bureau for over a decade. Located in the heart of Northern California wine country, Sonoma Valley is a 17-mile long valley within Sonoma County that encompasses the city of Sonoma and the villages of The Springs, Glen Ellen, Carneros, Bennett Valley and Kenwood. 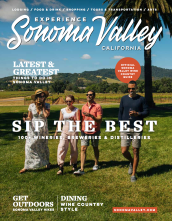 A year-round destination, Sonoma Valley is home to more than 100 premium wineries; a variety of lodging options ranging from luxury hotels to charming bed and breakfasts; award-winning olive oil producers; breweries; artisan shopping; delicious dining; 13,000 acres of state and regional parks; world-class spas and endless discovery. The town of Sonoma is the birthplace of the state of California, as well as the state’s wine industry. Sonoma Valley is home to the state’s oldest commercial and oldest family-run wineries, and 85 percent of wineries within Sonoma Valley are family owned. The destination, which is easily accessible from all major Northern California airports, encourages all visitors to partake in its wine country lifestyle and enjoy a vacation that is fun, friendly and beautiful. For more information, visit SonomaValley.com, or follow Sonoma Valley on Instagram at @sonoma_valley, and on Facebook at @ExperienceSonomaValley.